Among the many things I’m thankful for on this Thanksgiving Day, I’m grateful for the 1 percent. No, not the targets of misguided OWS derision — I’m talking about the 1 percent of Americans who wear the uniforms of the United States Armed Forces. Harry is now officially known as ABE2 Petersen (AW/SW). Unpacking that leads to Aviation Boatswain’s Mate (Equipment) Second Class (Air Warfare/Surface Warfare). Proud though I am of my son, there is a tiny part of me that wishes he were in the Army — then I could just call him “Sarge”. As a Third Class Petty Officer before yesterday, he was the equivalent of a Corporal. “Boatswain’s Mate“, a generalist designation for a deck sailor, is one of the oldest ratings in the United States Navy, dating from the Revolutionary War. “Aviation Boatswain’s Mate” is a more recent and more specialized field, designating the people who launch and recover planes on an aircraft carrier. To make things even more confusing, Aviation Boatswain’s Mates are subcategorized as (Equipment), (Handling) or (Fuels). (AW/SW) means he has qualifications related to both air warfare and surface warfare. ABEs like Harry are responsible for maintaining and operating the catapults, arresting gear, and other highly sophisticated equipment used to launch and recover planes. The pilots themselves are officers, but they take direction from Aviation Boatswain’s Mates when preparing for takeoff. ABEs wear green shirts on deck (ABHs wear yellow, ABFs purple). Harry is assigned to the “waist cat” crew of the U.S.S. Nimitz, the lead ship of the Nimitz-class carriers, which include 10 of the 11 active aircraft carriers in the American fleet. The waist catapult (as opposed to the bow catapult) launches planes diagonally off of the port side of the ship. The Nimitz is a multi-billion-dollar, nuclear-powered floating city of 5,000, with its own zip code (96620) and five dentists onboard when under way. It was commissioned in 1975, 13 years before Harry was born, and currently is in dry dock in Bremerton, Washington, across the Puget Sound from Seattle. Harry has been deployed twice on six-month “cruises” to the Indian Ocean in support of the war in Afghanistan, once on the Nimitz and once on temporary deployment with the U.S.S. Ronald Reagan. 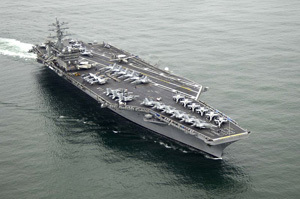 On the Reagan he participated in relief efforts after the tsunami devastated Japan. He’s in one of the hardest-working ratings in the Navy — while under way, he routinely works 14-hour days or more. Life on shore is less frenetic. The Nimitz will get under way again for testing purposes early next year. Harry delights in telling family and friends that he has the most dangerous job in the Navy, other than Navy SEALs. But while a suicide bomber killed 17 American sailors on the U.S.S. Cole when it was moored in a Yemeni port in 2000, at least the jihadis don’t have a navy or air force, and carriers are surrounded and protected by other ships while at sea. I’m proud of him for serving, and as a parent I’m grateful that he’s not carrying a rifle in Kandahar. The riflemen and their families are also in my prayers, today and every day. Congratulations, Sarge, and Happy Thanksgiving. This entry was posted in Uncategorized and tagged Harry, Military, Occupy Wall Street by Kirk Petersen. Bookmark the permalink. Congrats to your son and all the Men and women who serve with a happy grateful heart. My son, also in the Navy, is thankful for the liberties our country affords us and the rights we can fight for and ideas we can freely speak against. This time of year he is thankful for his buddies when he cannot come home. He is in the US, but unable to leave so his friends are his family. And I, his mom, am thankful he is not in Afghanistan or Iraq, but I do pray for the ones who are and their families here at home. A shout out for the WASP in VA! Thanks, Marianne, and best wishes to your son. What does he do in the Navy? I hope it’s not to late to congratulate you Harry.